Here we will explain how to add tags to multiple cards at once. Tags cannot be added to multiple cards by using the business card import function. (Business cards that are imported will be created as new business cards, so overwriting and updating previously registered data cannot be done). Tags can also be added when scanning cards, so please consider this as an option for how you do your operations. 2. Add a tag to the search result business cards displayed. 1. Do an advanced search, and download the cards you want to add a tag to. 2. Refine the data in this downloaded file. 3. Using the bulk tag adding function, add tags to the business cards. * Tags cannot be added by importing, so please try using this method. 1. Do a search for the data you want to add tags to (or all data). 2. Add a tag to all the search results. 2. Add the item "Card ID" to the data from step 1, and then download. 3. Using Excel or other programs, refine and extract from the data the business cards you want to add tags to. Copy the Card IDs of the business cards you wish to use. 4. 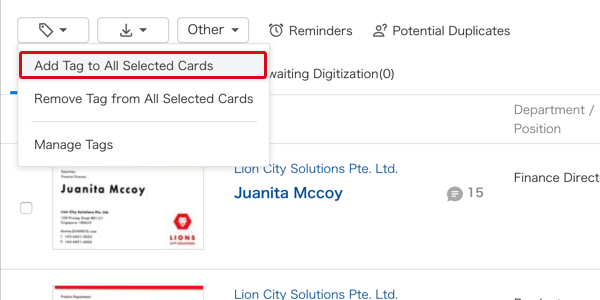 From the Advanced search screen, do a multiple-specification search using the business card IDs copied in step 3. 5. Add a tag to all the search results gotten from the search in step 4. 6. If there are multiple tags you would like to attach, repeat steps 3 to 5 as necessary.